Northgate Mall: Serving A Wide Demographic Well? July 20, 2010 / 1 Comment on Northgate Mall: Serving A Wide Demographic Well? Northgate Mall first and foremost appears to be the most generic type of mall found almost anywhere in America. It does however have some interesting features that appear specific to its location. 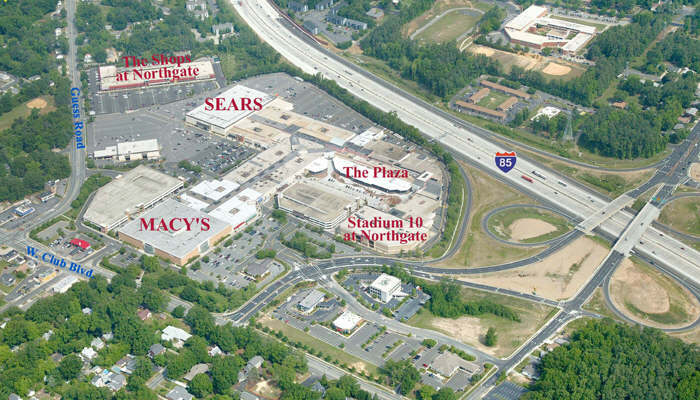 First, there is both a Sears Auto Repair and a Macy’s, which seems to illustrate the wide range of people who shop at Northgate. In addition there is a store called “Caroline’s Plus Sizes” as well as several national chain fast food, and casual dining restaurants like Champps and Boston Market. This seems to imply something about what these shoppers eat, and what they look like, and by extension something about their economic situation. The mall itself is beginning to look old and run down, is completely indoors and seems somewhat impenetrable from the outside. In addition, poor traffic flow directions on the outside of the mall make it difficult to navigate around.